Tiger Tales Books recently released their new Spring line-up and so we enjoyed receiving a box full of new titles to read! Here are some new padded baby books from their collection that we thought were awfully cute. One Rainy Day is a perfect book for here in Oregon. (But it's not so bad for spring-time at large, for all that!) 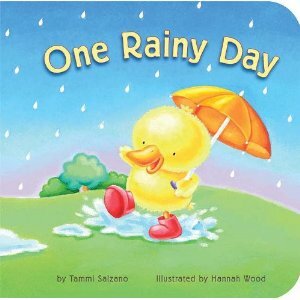 Following the antics of a little duck who loves the rain, we learn about what is needed to play in such weather as well as learning about colors. We need: red boots, an orange umbrella, a green frog, blue puddles, etc. On each page spread we see Little Duck splashing about and having a great time in the rain, just as little children usually do. Quite cute and definitely one we're glad to add to our home collection. 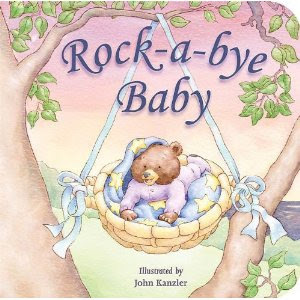 Rock-a-bye Baby is not just a padded board book but also has a fuzzy bear on its front cover, inviting little hands to touch and feel. Illustrated by John Kanzler, the words will be all-too-familiar to you as the adult reader. You can choose to sing a long with the words or read them, of course. The important and fun part of this book is that you would have a babe in arms when you are making your way through it! This book would make the perfect gift for new parents and babies. Sweet. Cute. Familiar. Fun. Is hearing them trying to speak. It's not "How do you do?" As I'd say to you. It's more of a "Click-whistle-squeak!" 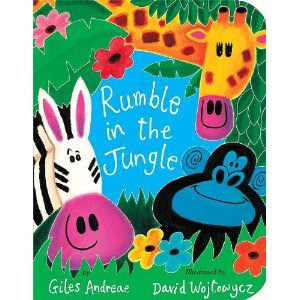 Rumble in the Jungle is, of course, quite similar in style, only our subject matter in this particular book is - ta da! - jungle animals! From chimpanzees to leopards and tigers, this is a fun read. My boys both took great delight in turning the pages and discovering which animals were coming up next. 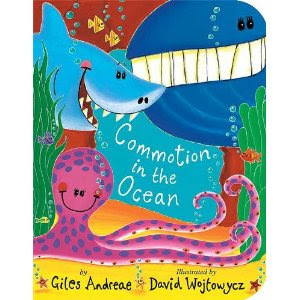 Lots of smiles from this book and we recommend it. Thanks, Tiger Tales Books, for sending and allowing us to preview your Spring line-up! We love your offering and appreciated the opportunity of reading through these fun titles. And thanks to you for being such a great supporter of tiger tales! We really appreciate your wonderful reviews and your help in spreading the word.